A romantic scuba-diving couple are taking the plunge again. Jamie Heptonstall popped the question to his wife, Sophie, using sign language 60 feet underwater. Now the couple from Lymm, in Cheshire, have come up with the perfect way of celebrating their first anniversary. They will be spending the day submerged in the vast waters of Scapa Flow in the Orkney Islands. This rapture of the deep is their idea of heaven with the chance to dive among the huge number of wrecks that litter one of the world’s finest but most remote natural harbours. 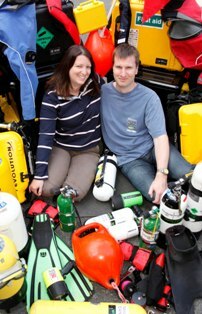 The couple met through their mutual love of diving and their membership of the British Sub Aqua Club (BSAC). Jamie, 34, said: “We’ve been friends for quite a long time and after we both became single our relationship blossomed. 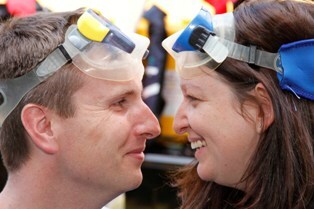 “I actually proposed under water, in Capenwray Quarry, near Lancaster. I didn’t have a ring because it was a spur of the moment thing”. Both Jamie, who works for construction company Bomer and Kirkland and Sophie, 31, a marketing manager, are qualified diving instructors and he admits that their love of diving borders on an obsession. Sophie is also a volunteer Board member of BSAC which is based at Ellesmere Port. Jamie and Sophie have been active in charity work through their diving and instead of wedding presents they asked for donations to the RNLI and Cancer Research and raised over £4,000. Scapa Flow really is wreck central. This was where the captured First World War German High Seas Fleet was deliberately sunk by its own crews and many of the ships still lie down in the depths of Scapa Flow. Jamie and Sophie will be able to indulge their passion for wreck diving among these wartime giants which include the dreadnought Markgraf, 575 feet long and over 25,000 tons, and its sister ships Konig and Kronprinz Wilhelm, once the pride of the German navy.